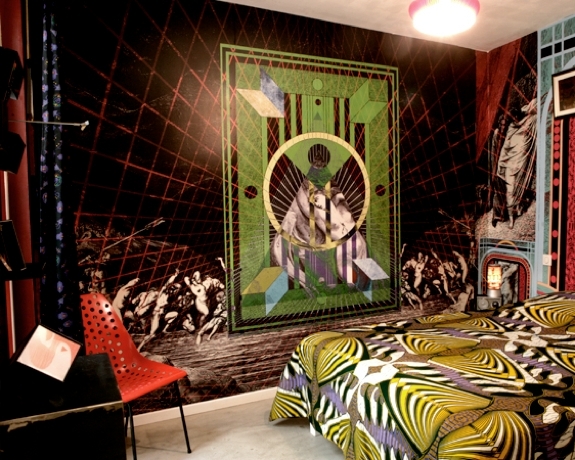 Inside the Au Vieux Panier Hotel in Marseille, France there’s a guest room that, if it doesn’t have the world’s most unusual design, certainly has the most schizophrenic. The room, referred to as The Panic Room, is half bone white — white bed sheets, white carpet, white walls, white furniture. 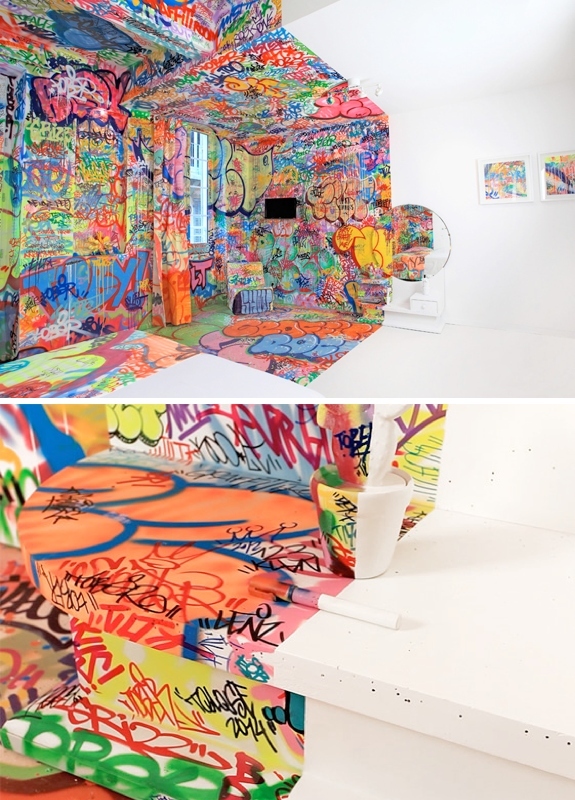 The other half of the room is entirely decorated in bright graffiti — graffitied bed sheets, graffitied carpet, graffitied walls, graffitied furniture. The dividing line between the two halves, it is as stark as can be, bisecting the room’s mirror, dresser and even the bed! Stepping between the two halves of the room feels something like stepping between dimensions in reality. 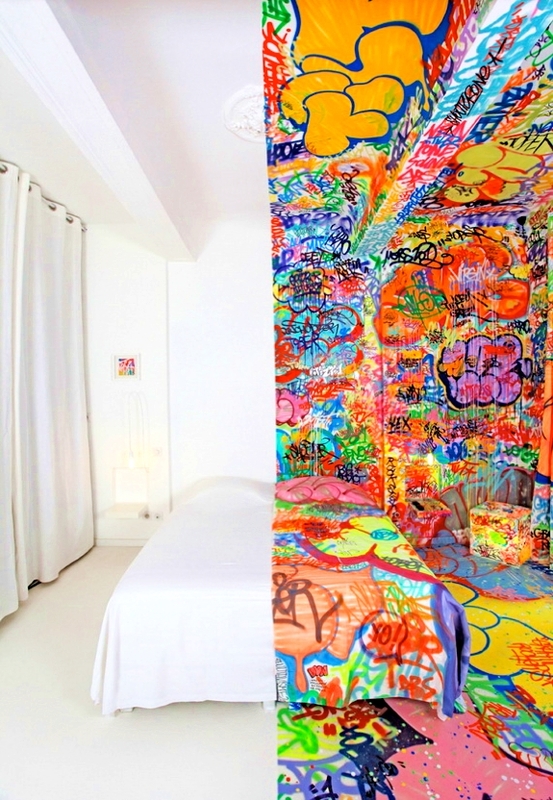 The Panic Room’s design is so arresting that it’s easy to overlook how cool the graffiti is in its own right. That graffiti was not spontaneously done by some hooligan with a spray can. Instead, it’s the work of a semi-famous artist named Tilt (or perhaps that’s Mr. Tilt to those who don’t know him well) whose colorful creations have been displayed in museums from New York to New Zealand. If you are feeling divided about whether or not to spend a night in the Panic Room, Au Vieux Panier has five other rooms to choose from. 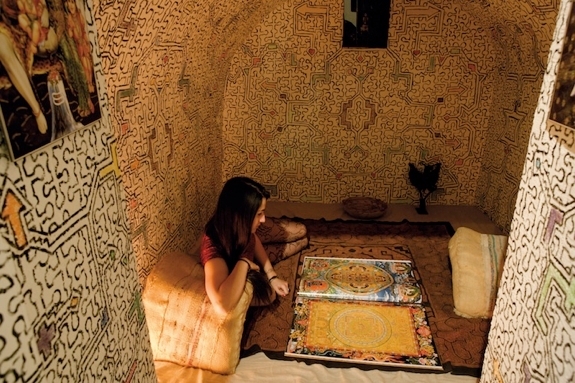 Though none of them are as unusual or outrageous as the Panic Room, each was designed by a different artist and has its own charms. The largest and most comfortable of the rooms is the Fusion Suite; it’s decorated in a funky space-age bedtime theme by French artist Philippe Baudelocque. 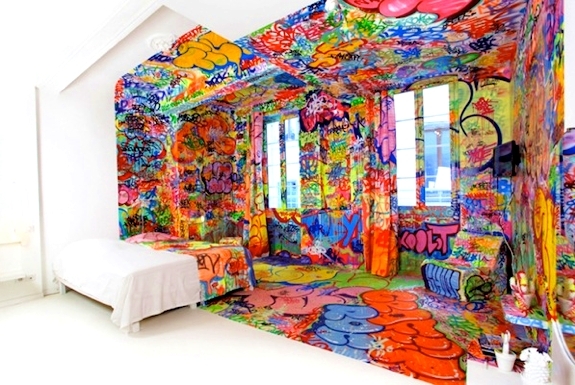 We also like the richly colored Mass Confusion and Matthias Olmeta rooms. See photos below. 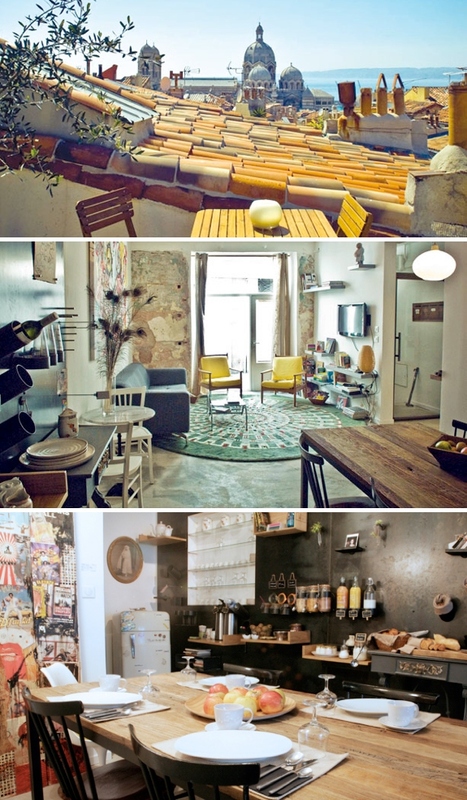 At the moment, the public areas of Au Vieux Panier are rather cool too. Though a hotel by name, the size and feel of the place is more like a bed and breakfast. Guests hang out in the retro living room, eat breakfast in the modern-country dinning room and take in the views of Marseille from an inviting rooftop terrace. We started the above paragraph with “at the moment” because the entire design of Au Vieux Panier, including all the rooms, changes every year. If you are an artist with room design idea (half treehouse room, half cave hotel perhaps?) pitch it to the hotel proprietors via the Au Vieux Panier website. And who knows? We could end up featuring your design on Spot Cool Stuff next year! When: Note that Au Vieux Panier closes for a month every year, usually around January or February, to redecorate. If you go: The reservation form on the Au Vieux Panier website does not provide for instant booking. Don’t count on staying during your selected dates until you receive a confirmation back from the hotel. Family friendly? Kids are allowed, though the Fusion Suite is really the only room that has the sleeping space to comfortably accommodate them. Certainly a unique hotel room! I’m not sure either if I would want to sleep in it. I wonder what dreams you would have depending on what side you slept on?! Yet another hotel reviewed on this site that blows my mind! Though, okay, I’m not sure I’d want to sleep in it.